This one was pretty much a freebie on my way to Kings Canyon. I had dropped my wife off at the San Jose Airport around 2p before heading out of town and across the state, thinking I might get a short hike in before sunset. Delilah BM is the highpoint of Pine Ridge, a P900 on the western edge of Sequoia National Forest and within the Giant Sequoia National Monument. I had noted that Laura Newman had been to the summit in 2015, so this would give me a chance to take one back from my archnemisis. She has a much beefier vehicle than myself so I wasn't too sure what sort of road conditions I might find. The peak is some 6.5mi from SR180 along a series of Forest Service roads that turned out to be pretty good. The first part is paved, changing to good gravel to within a couple miles of the summit. There is a rundown resort of sorts at the end of the gravel portion that looks to rent cabins and such, but somewhat trashy-looking. The road continues past this to the Delilah Lookout situated at the north end of Pine Ridge, below the highpoint. Now dirt, the road is still pretty decent and most vehicles can probably drive all the way to the lookout, a mile past the highpoint. I stopped at a clearing about 3/4mi before the summit and walked from there. The sun was setting quickly as I made it to the top just at sunset. There is a small sign marking the benchmark's location and a small cairn built by Gordon and Barbara for a register they left in 2012. This was probably one of the last summits before Gordon gave up peakbagging the following year. There were a few other entries from 2015 and 2016, including Laura's. 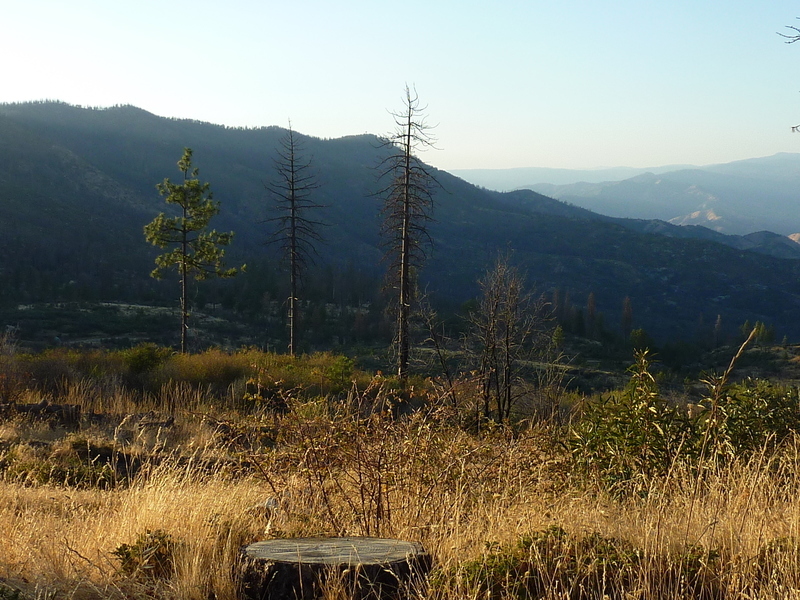 Fire consumed the forest covering the ridge a few years ago but the views remain poor due to all the standing snags. There are probably good views of Kings Canyon from the lookout but as it was going to be dark shortly, I went back to the van rather than continue to the lookout. Perhaps another time. After returning to SR180, I drove up into the park and then down to Kings Canyon (though not before a short stop at Grant Grove Village for some ice cream) where I would spend the night with plans to climb Grand Sentinel in the morning.